Two guys talking. Yep, that's it; two guys talking. Now have I managed to spark your interest, whet your appétit or arouse your curiosity? Have you already moved on to another article, another movie review in the hopes of finding something which is truly worth your time? Too bad. This movie is hilarious. Who would have guessed that two guys talking, whether eating at a restaurant, driving a car or just out walking could be so funny? Our two main characters, British actors and comedians Steve Coogan and Rob Brydon are for starters pretty funny personalities. It turns out this film is an edited version of a six part television series. The series was first aired back in November 2010 while the film was shown at the Toronto Film Festival in September 2010. The premise is that Steve Coogan accepts a commission from The Observer newspaper to do a tour of some restaurants in northern England. Unfortunately, Coogan's girlfriend bows out as she thinks they need to take a break so Coogan then convinces his friend Rob to join him on the trip. The film is made up of the two of them kibitzing as they visit various restaurants savouring the culinary delights of the region. The story is fiction and apparently much of the two of them clowning around is improvised but oh what fun. If you went out to dinner with either one of these guys, I'm guessing you'd just sit back and let them go at it as I have the idea these two extroverts would be impossible to get to shut up. Thank gawd they are funny. While our two protagonists ramble on about various topics including famous authors who may have once lived the places they visit, they up the ante in humour as they are both fairly gifted mimics. Yes, they comment but they comment using various famous voices such as Michael Caine, Sean Connery, Ian McKellan, Woody Allen and others. Their stream of consciousness riffing on each other's thoughts which includes at one point a duet of Abba's song The Winner Takes It All, had me and the rest of the audience spontaneously guffawing as we all wondered just what the next piece of silliness was going to come out of their mouths. This was good; really good. When the lights came up, I looked around and guessed out of the 50 or so people there for the middle of the afternoon matinee, 90% were older than 40 and a fair number were - Gasp, dare I say it? - older than 50. I doubt you're going to find anybody who watched Transformers: Dark of the Moon at this movie. If you're 18, you'll probably be bored out of your mind but if you're 48, you'll love it. How unfortunate. This film is a gem. It is absolutely amazing to realise that it is possible to make an entertaining film without special effects, without a car chase and without a single explosion. At the end of the day, it is the human relations which draw us to any story and these two guys have quite a time of it much to the delight of anybody who has the good fortune to walk into a theatre playing this film. I highly recommend it. I found it thoroughly enjoyable. Second series of The Trip to be filmed in Italy? The Trip, the BBC comedy show starring Steve Coogan and Rob Brydon, looks set to return for a second series. Co-producer Andrew Eaton let slip yesterday that plans are underway to film a new six-part series in Italy later this year. Amiable, funny and sometimes insightful, The Trip works as both a showcase for the enduring chemistry between stars Steve Coogan and Rob Brydon and an unexpected perusal of men entering mid-life crises. The Trip is a BAFTA award-winning television sitcom series which was first broadcast on BBC Two and BBC HD in the United Kingdom. 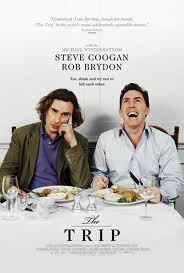 The series stars Steve Coogan and Rob Brydon as fictionalised versions of themselves undertaking a restaurant tour of northern England. The six episode series, which is partly improvised, was first broadcast on Monday nights at 10:00pm on BBC Two starting on 1 November 2010. The series was edited into a feature film which premiered at the Toronto International Film festival in September 2010 and is set for release in the US by IFC Films in 2011. Stephen John "Steve" Coogan (born 14 October 1965) is an English comedian, actor, writer and producer. His best known character in the United Kingdom is Alan Partridge, a socially awkward and politically incorrect regional media personality, who featured in several television series, such as The Day Today, Knowing Me Knowing You with Alan Partridge and I'm Alan Partridge. Outside the UK, Coogan is better known for his roles in films such as Night at the Museum, Tropic Thunder, Hamlet 2, and The Other Guys. Rob Brydon (born Robert Brydon Jones; 3 May 1965) is a BAFTA-nominated Welsh actor, comedian, radio and television presenter, singer and impressionist. He played Uncle Bryn in the comedy drama Gavin and Stacey, is the host of panel quiz show Would I Lie To You?, plays a parody of himself in Rob Brydon's Annually Retentive and played Keith Barret in the BBC comedy Marion and Geoff and its spin-off The Keith Barret Show. He also hosts The Rob Brydon Show, a fun chat show hit for the BBC. Brydon has worked with a number of comedians and actors, notably Steve Coogan and Julia Davis.